(rollover to compare with normal) What Is Bicuspid Aortic Valve? The aortic valve conducts oxygen-rich blood from the left ventricle into the aorta, which carries it to the body tissues. Normally, this valve has three leaflets. Occasionally, people are born with an aortic valve that has only two leaflets. This is known as a bicuspid aortic valve. 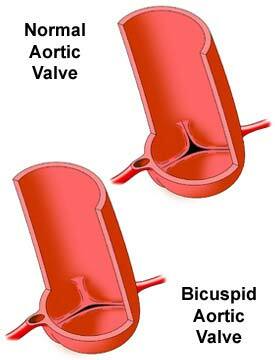 A bicuspid aortic valve may occur in isolation in an otherwise normal heart, or it may occur with other heart defects. Isolated biscupid aortic valve is the most common of all congenital cardiac anomalies and usually has no effects on heart function. If a bicuspid aortic valve does not open normally, aortic valve stenosis can result. 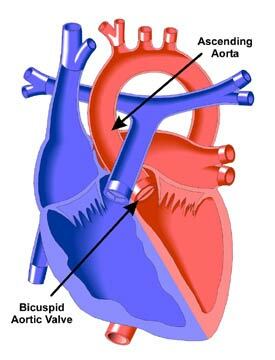 The aortic valve is generally bicuspid in cases of Aortic Stenosis, which accounts for 3-6% of all cases of congenital heart disease.